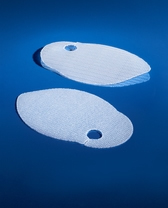 Rigid or semi-rigid preshaped meshes with eccentric eye, used in male inguinal hernia defects in the presence of significant destruction or weakness of the posterior wall. This mesh is used with the preshaped Hertra. The T5 mesh is positioned below the transversalis fascia and the distance between the T5 and the Hertra prosthesis can be adapted in the most appropriate anatomic manner via the feedthrough suture system created by Prof. Trabucco.